William Nylander scored on a penalty shot 6 seconds into overtime to lift the Toronto Maple Leafs to a 3-2 win over the sagging Chicago Blackhawks on Wednesday night. The Toronto Maple Leafs found themselves in yet another tight game. William Nylander found a way to make sure they got two points this time. Nylander scored on a penalty shot 6 seconds into overtime to lift the Maple Leafs to a 3-2 win over the sagging Chicago Blackhawks on Wednesday night. 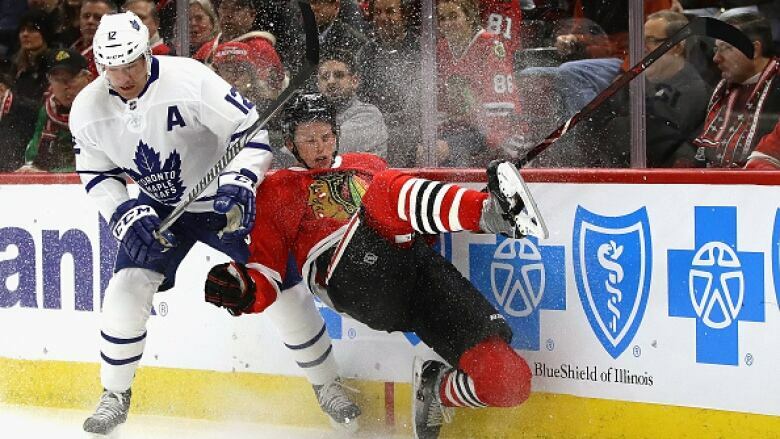 Nylander was awarded the attempt after he broke in alone on Jeff Glass from the opening faceoff in the extra period, but was hooked from behind by Chicago's Duncan Keith. Nylander scored the game-winner and his 10th goal by faking Glass and then burying a high backhander to send the Blackhawks to their fourth straight defeat. "I thought I needed to throw a little harder fake on him so he'd bite," Nylander said. "I went to the backhand on the two previous breakaways. Third time's the lucky charm." Nylander was stopped by Glass with 4:02 left in the third period when he pounced on Jordan Oesterle's turnover and cut in alone. "I've had breakaways in the previous games and hadn't scored," Nylander said. "So it's nice to score on one." Eight of Toronto's last nine games have been decided by one goal, including three overtime losses and one in regulation. In the Maple Leafs' 4-2 loss to Colorado on Monday, the Avalanche's Gabriel Landeskog finished the scoring with a late empty-netter. "That's the way it is every night," said Maple Leafs coach Mike Babcock, whose team won for second time in seven games. "I still think we can play way better." Toronto's Nazem Kadri connected for his 15th goal, a power-play score that snapped a seven-game scoring drought and was just his second goal in 20 games. Mitch Marner also scored for the Maple Leafs. Brent Seabrook and Nick Schmaltz scored power-play goals for Chicago, which snapped an 0-for-16 drought with the man advantage. Schmaltz's goal, at 7:55 of the third period, tied it at 2. Seabrook's first-period score was the Blackhawks' first power-play goal at home since Dec. 8 against Buffalo, ending a span of 33 failed chances over 10 games. Chicago coach Joel Quenneville sounded almost more wistful than disappointed about how his team lost this one. "We had one [a hooking from behind] that was called a two-minute minor," Quenneville said. "I don't know what's more advantageous: a power-play with a 4-on-3 or a penalty shot." Toronto's Frederik Andersen made 34 saves, including some tough chances as Chicago battled for a second straight game following several soft efforts. Glass finished with 33 stops. Seabrook's power-play goal opened the scoring 5:29 in. His shot from the top of the right circle deflected off the stick of Toronto's Leo Komarov and flipped past Andersen. Marner was credited with tying it 1-all with 3:23 left in the first to cap a scramble in the Chicago zone. After Glass made a couple of tough saves, Jake Gardiner's shot from the top of the left circle struck Marner in traffic and deflected in. Andersen came up with the sharper stops in the scoreless second. He made a glove save on Anthony Duclair from the slot at 1:33, then a pair of close-in rapid-fire saves on Patrick Sharp and Ryan Hartman midway through the period. Kadri put Toronto ahead 2-1 with a power-play goal at 4:58 of the third. He connected from the right edge of the crease when he one-timed in a pinpoint, cross-ice feed from Tyler Bozak. Schmaltz's goal 2:57 later tied it at 2 and withstood a video review. From a goalmouth scrum, Schmaltz fired in a loose puck from the right side of the crease and with Andersen down. The puck crossed the goal line just before Chicago's Artem Anisimov tumbled over the Toronto goalie.